It used to be said that honesty was the best policy. There are a number of reasons for this but perhaps the most obvious is that you can never get caught out telling the truth. If it is a simple lie that you have just told to one person then it should be easy enough to remember but one lie does tend to lead to another and we can indeed weave a somewhat tangled web when first we practice to deceive. Fortunately nowadays there are several helpful tools that can help us keep track of this tangled web, the most obvious of which is the spreadsheet. Spreadsheets are remarkably versatile things and certainly need not be confined to work or finances. Let’s say, as a simple example, that you have a wife and a mistress. You have given a false name to your mistress, so that she can’t cause trouble if you break up, and told her that you are a lion tamer because it sounded more exciting than your real profession. Well if you can’t keep track of that in your head then I would suggest that you are probably a likely candidate for the local Alzheimer’s society but if you were going to create a spreadsheet to keep track of the situation it might look something like this. Nowadays most people have a Smartphone and there are several free spreadsheet applications you can install on your phone perhaps the most obvious one being the one that comes with Google Docs. So far we have just been treating the spreadsheet as a notebook but now we have accrued a fair amount of information in there it can be made to help you take decisions. Lets postulate that you are living beyond your means and one of these women has got to go. We now know how many times this month you have taken each of these ladies out and how many times it resulted in forming the beast with two backs. With a few fancy formulas this can be used to create the following graph. We can see then that in terms of ‘return on investment’, even if KFC was not vastly cheaper than The Regency Hotel, Jane is definitely in the safe zone. 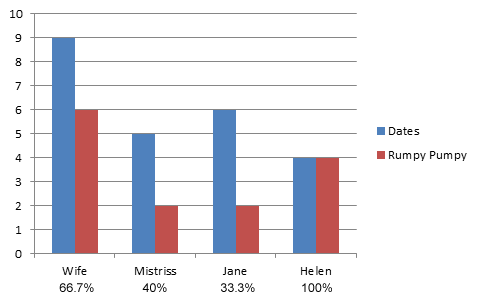 The wife is clearly surpassing expectations and it looks as though Jane and the Mistress are on fairly thin ice. These spreadsheets can get as convoluted as you like. You could incorporate pivot tables, advanced charting, macros and all sorts of fancy formulas but anyone with that level of spreadsheet expertise is unlikely to have one girlfriend, and almost certainly not enough to warrant a spreadsheet. In Summary, although in many ways the lot of the modern day liar has got a lot harder as Facebook, Twitter and suchlike drive a coach and four through much of our privacy, there are some advantages to being a 21st century liar as well.